My book club (or Salon as it has been christened by Lily), is comprised of a group of smart, successful and accomplished women. Two lawyers, a former Mayor, a judge, published author, former corporate executive and a former educator, this group produces intense conversations and debates. But, no matter what topic is up for discussion, there is always plenty of delicious food and wine. We talk...we cook...we eat! "Written without a trace of sentimentality or apology, this is an unforgettable personal story—the truth as a remarkable young woman named Anne Moody lived it. 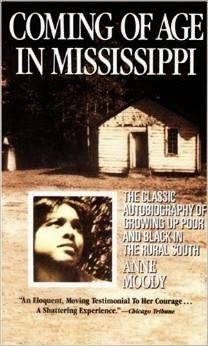 To read her book is to know what it is to have grown up black in Mississippi in the forties an fifties—and to have survived with pride and courage intact. In this now classic autobiography, she details the sights, smells, and suffering of growing up in a racist society and candidly reveals the soul of a black girl who had the courage to challenge it. The result is a touchstone work: an accurate, authoritative portrait of black family life in the rural South and a moving account of a woman's indomitable heart." The book provided lots of fodder for discussion and, since it was based in Mississippi, Lily (our host) decided on a classically Southern menu for the night. She assigned each of us a dish and gave me corn casserole. 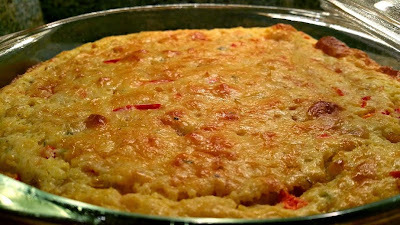 I confess that I had never heard of corn casserole (not a big item in California), so I did some research. Who knew? There are 2,580,000 results on Google alone! And they all are a version of the same recipe starting with the Jiffy brand corn muffin mix and additions of creamed corn, canned corn, sour cream, and butter. Some have eggs; some do not. With a bit of trepidation, I gave it a try. To my relief and surprise, it was delicious! Light, airy, creamy and slightly sweet. 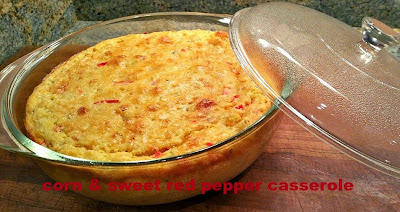 I added fresh red bell pepper and green onions for color and crunch, but this is optional. I think I will try it with fresh corn this summer. The dish is super simple and packable, so it was perfect to take to book club. 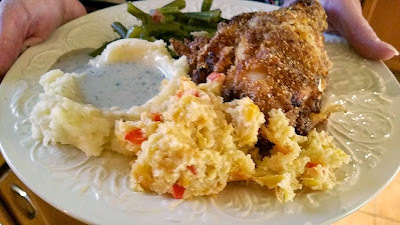 We had a classic Southern supper of fried chicken, mashed potatoes & gravy, green beans and biscuits with the casserole. But I think it would also be good with barbecue, or glazed ham or even with eggs for breakfast. 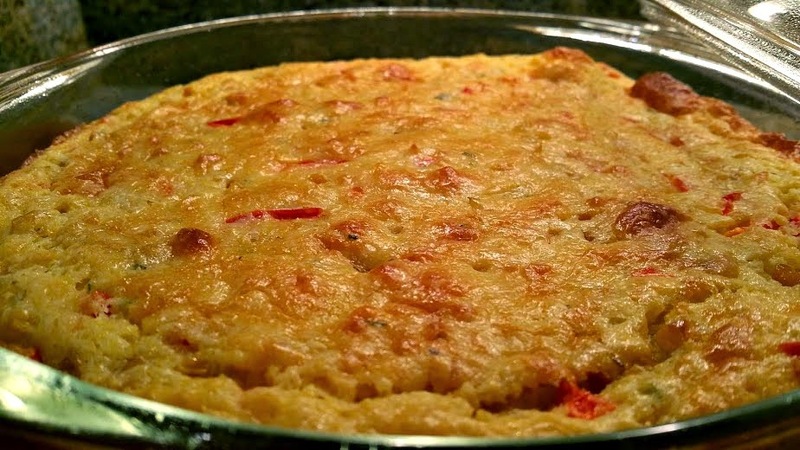 If you grew up eating corn casserole, please tell me how you made yours in the comments section...if, like me, this is new to you...give it a try and let me know what you think. Happy summer everyone! Preheat oven to 375 degrees. Grease a large casserole dish and set aside. Combine all ingredients in large bowl until well mixed. Pour into prepared dish and bake for 40-50 minutes or until casserole is set in the middle. Summer means easy, breezy dishes made from fresh, just-picked produce and this week at Food Network's Summer Soiree we are celebrating Portable/picnic-ready (Anything you can easily pack and take with you). Do you have a favorite portable recipe? Share in the comments section and/or link to your blog if you have one. And be sure to check out the delicious sounding recipes from my blogger friends and Food Network.